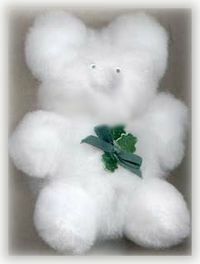 Make a cute pompom bear, proudly wearing the green, to help celebrate St. Patrick’s Day. Glue the large pompom and the medium pompom together. Trim away a little fluff from one side of both pompoms. This trimmed area will be the bear’s tummy. The medium pompom will be the bear’s face and the large one will be its tummy. Glue two small pompoms for arms, two small pompoms for legs, two small pompoms for ears and one small pompom to the back centre bottom of the large pompom (this will help teddy to sit up on his own) and one smaller pompom to centre face for the bear’s nose. Refer to photo for placement. Tie a bow and glue to the teddy’s tummy. Glue a shamrock confetti piece just below your green ribbon bow. You can cut a small shamrock from craft foam or paper instead of using confetti. Glue a jewelry pin to the back of bear and allow the glue to dry completely. These really are easy to make and so adorable. Glue two black beads for eyes.